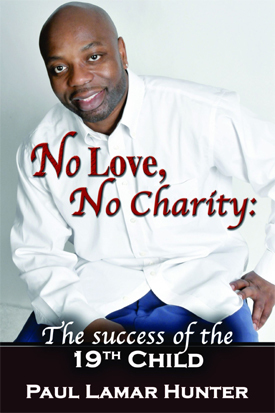 No Love, No Charity: the Success of the 19th Child, is the riveting debut book by Paul Lamar Hunter. Though many would consider Paul to be an unlikely candidate to become successful, this thrilling autobiographical account describes how he made it despite overwhelming odds. As the 19th child of a twenty-one, his troubled life traversed the perils of poverty, neglect, dysfunction, and even deaths. Paul describes what it was like growing up in the shadows of a famous yet detached mother whose affections were focused on the homeless shelter that she founded. Though the shelter was supposed to be a haven for the downtrodden, it was actually the breeding ground for dysfunction and despondency. Despite Paul's misfortunes and failures, his determined spirit and his indelible faith lifted him up above the fray to become the first in his family to graduate from college. Now moving full-speed ahead, Paul Lamar Hunter is living proof that neither limits nor lineage determine the quality of one's life-but faith, fortitude, and determination do.